Dr. Stewart is the Vice President for Medical Affairs and the Chief Medical Officer of Southern Ohio Medical Center, and the Chairman and CEO of the SOMC Medical Care Foundation, Inc., a multi-specialty physician practice group, in Portsmouth, Ohio. Dr. Stewart is a Clinical Professor of Psychiatry at the Ohio University College of Osteopathic Medicine, and he also still practices adult psychiatry part-time. Dr. Stewart was born and raised in Rome, Georgia. He graduated from Berry College in Mount Berry, Georgia and received his MD from the Medical College of Georgia. He completed his psychiatric residency at the Medical College of Georgia and then served as Chief of the Mental Health Clinic at the US Air Force Hospital near Rapid City, South Dakota. He opened his private practice in Portsmouth in 1981. He returned to graduate school and earned an MBA from Ohio University in 1999. 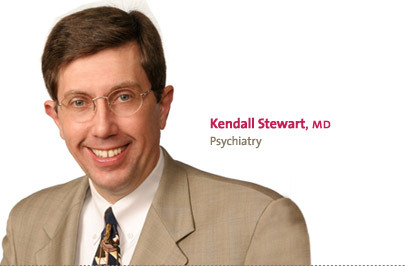 Dr. Stewart is a Diplomate of the American Board of Psychiatry and Neurology and a Distinguished Lifetime Fellow of the American Psychiatric Association. He is a past president of the Ohio Psychiatric Association. Dr. Stewart is a former Chairman of The Ohio Partnership for Excellence. He also served as a member of the Board of Examiners for the Malcolm Baldrige National Quality Award. Dr. Stewart is the senior author of, “A Portable Mentor for Organizational Leaders,” a book published by SOMCPress in 2003. He and his wife, Fay, have two grown sons. A Portable Mentor for Organizational Leaders provides lessons for potential leaders through succinct management advice addressing a wide range of organizational behavior topics. Through leadership advice and management tips, psychiatrist Kendall L. Stewart, MD, and a dozen directors and leaders from Southern Ohio Medical Center (SOMC) describe in easily readable points how leadership behavior drives teamwork, credibility in management, leadership consistency and management techniques. Dr. Stewart and the SOMC writing teams present work from frontline management on a wide range of leadership challenges including teamwork and conflict, communication in relationships, setting leadership tone and team relationships, among others. The book is presented in sections on personal development, dealing with others and barriers to excellence. Within each section are straightforward perspectives on successful management, dealing with confrontation, preparing for criticism, accepting feedback, avoiding distractions, communicating goals and the importance of listening, among many other issues within the corporate culture. Call (740) 356-8153 to order your copy. SOMC underwent a distinctive change in its focus and culture in the mid-1990s, moving from patient satisfaction scores in single digits to some of the best in the nation and earning the highest level of the Ohio Partnership For Excellence. A consensus review finalist for the Malcolm Baldrige National Quality Award, SOMC has drawn national attention for its approach to fostering an environment of world class service in health care and organizational excellence. SOMC leaders are often sought by professional groups to share their experience, and the Portable Mentor for Organizational Leaders helps provide some of their most important lessons for the manager on-the-go. Today’s corporate challenges and increasing demands for performance improvement require effective coping strategies for leadership stress, and management style effectively setting the tone in work environments for successful organizational leadership. SOMC leaders have proven successful management can lead to customer satisfaction, not only in rural health care but in any environment of corporate change.